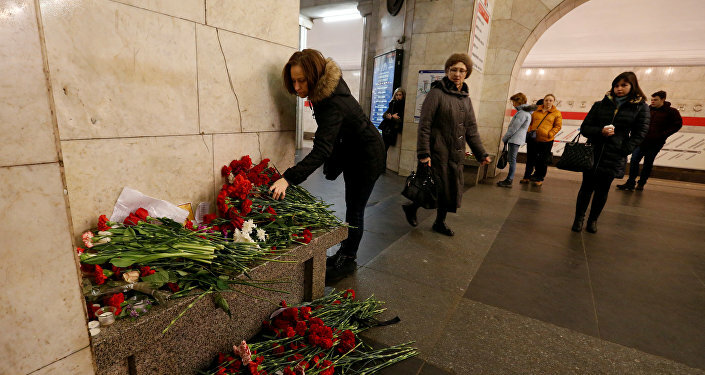 During the hearing, Akram Azimov, the elder brother of suspected organizer of the terrorist act in the St. Petersburg metro Abror Azimov, denied any involvement in the subway blast, a Sputnik correspondent reported from Moscow's Basmanny Court on Thursday. "I'm not involved in the terrorist attack," the suspect, who is charged with direct participation in the terrorist act, said. "During the questioning as a suspect, Azimov said that he and his brother performed actions that contributed to the explosion," the investigator said. Despite the suspect's plea, Moscow's Basmanny Court authorized the arrest of Akram Azimov. "Uphold the investigator's motion: choose in relation to Azimov, suspected of committing crimes stipulated by Russian Criminal Code articles 205 (terrorism) and 222 (illegal turnover of weapons), the measure of restraint in the form of taking into custody," Judge Elena Lenskaya announced. The Russian Investigative Committee subsequently said that Akram Azimov called by phone suicide bomber Akbarzhon Jalilov and transferred him money received in Turkey from a member of an international terrorist group. "The investigation provided information that Azimov contacted Jalilov and transferred money to him. He received this money for preparation of the terrorist act in Turkey from an active member of an international terrorist organization. Azimov also was engaged in forging documents so that members of this organization could freely move across Russia," Judge Elena Lenskaya's ruling on Azimov's arrest said.